In a sector where trouble is brewing this company raised guidance. Radius also bragged about two drugs with blockbuster potential. A week ago Radius took advantage of the JP Morgan Healthcare Conference to raise guidance for the full year 2018. Sales of their lead drug, Tymlos, surpassed the upper range of $95-$98 million. This is for osteoporosis in postmenopausal women. This is the only anabolic drug in the US market that is increasing its market share. Share rose from 20% at the beginning of 2018 to 27% at the end of the year. In December, market share of new anabolic patients was 40%. 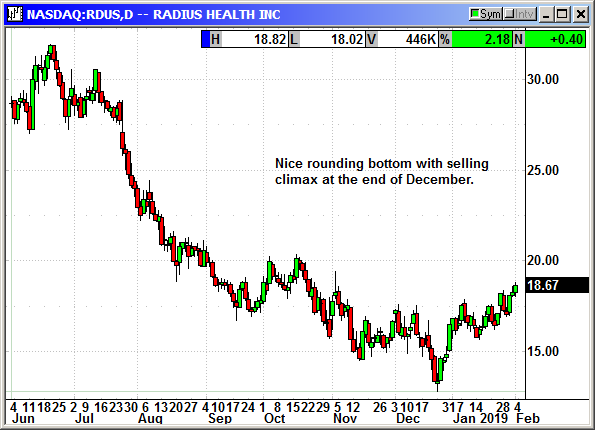 Buy RDUS shares, currently $18.67, stop loss $16.95. Optional: Buy March $20 call, currently $1.00, stop loss $16.95.